Located in a private 1,300 acre gated community with a 24 hour security guard, Oh My Stars offers luxurious exclusiveness only found in the Smoky Mountains. With nearby hiking trails, waterfalls and seasonal swimming pool access, you may never want to leave! Upon entry, you are immediately greeted by the warm and inviting all natural wood interior. With tasteful decor and exquisite attention to detail, your time spent here is sure to be relaxing and memorable. The spacious living area offers a beautiful stone accented fireplace, brand new flat screen TV, leather sofas and access to the covered rear deck. The gourmet kitchen is stocked with all of the modern conveniences and everything you will need to prepare the perfect meal for your family and friends. With newly updated cookware, you're sure to appreciate all the delicious meals you'll be able to create. The spacious, open style floor plan ensures that you will enjoy each others company no matter where you're located in the kitchen, dining and living areas. The main level master suite is complete with a log style King size bed and adjoining luxurious bath. Take a walk upstairs and you'll enter the open loft style pool table game room. Everyone will love testing each others skills and to see who the pool champion really is. You'll also love the beautiful chess and checkers set for game nights or other fun board games for all ages! Off of the game room is the second comfy and cozy bedroom featuring a log style King bed, cathedral ceiling and nearby full bath. At Oh My Stars, you'll love spending time outdoors. 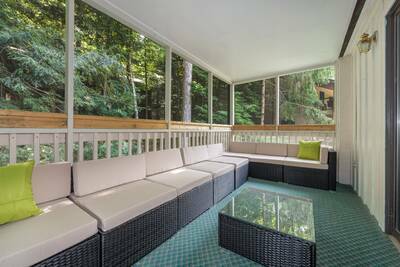 There's two massive, full length covered decks to take in the fresh Smoky Mountain air. One covered deck offers a 4-6 person bubbling hot tub with rocking chairs and the other features scenic mountain views with rocking chairs and a porch swing. 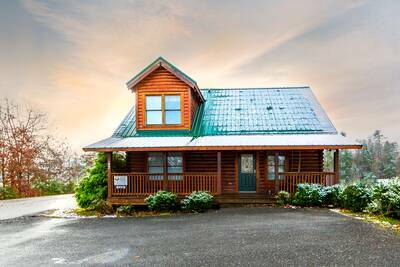 If you're looking for a beautiful, amenity filled Smoky Mountain vacation cabin rental that everyone will enjoy, then you'll love this newly updated cabin with brand new flat screen TVs, updated bedding, and more! From the exclusiveness of the gated community to the natural wood accents, you'll have everything you'll need for an unforgettable mountain experience. A: Yes it does have a mountain view. A: Hi Hunter! Oh My Stars is not a pet friendly property. We do have other properties on our program that are. A: Hi Harry! Oh My Stars is located within a gated community, Shagbark. A: To access the entry you would have stairs to climb. A: Hi Amanda! There is an outdoor pool located within the resort, just a short drive away. A: Yes, there is a stacked washer/dryer in the laundry closet. A: Hi Sandra! Yes it does. “ A very relaxing experience! Not a cabin for you if you not big on stairs. A beautiful wooded hill side to look at while hanging out in the hot tub. Mountain view off the front porch enjoying your morning coffee. Plenty of space to hang out without being right on top of each other. “ This cabin was excellent. The cabin was very clean and tastefully decorated. It was private but not too difficult to get to. We felt very secluded. Awesome weekend! No complaints, everything worked like it should. 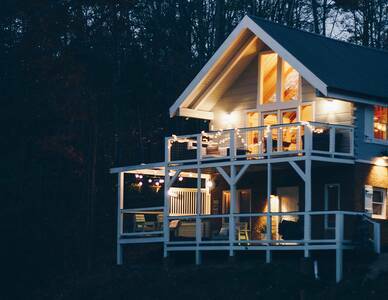 “ A Star Above is a beautiful cabin, very secluded which we loved. The decor inside the cabin was very homey and cozy. We will definetly be staying there again. We were very pleased with the comforts of home there. “ The cabin was very cozy and we enjoyed our three nights there. “ This is our first time in Tennessee and we really enjoyed it! Its absolutely beautiful here. The cabin is amazing! We really enjoyed ourselves. The views are gorgeous and we really liked being secluded, surrounded by woods. Wish we could stay longer! “ Wonderful cabin. Everything you need is there, the view is fantastic. It was a great place to relax. Very clean. “ We really enjoyed our stay at your Oh My Stars cabin. I fell in love with the cabin immediately. It was very cozy, we loved the floor plan and it was big enough for the four of us. 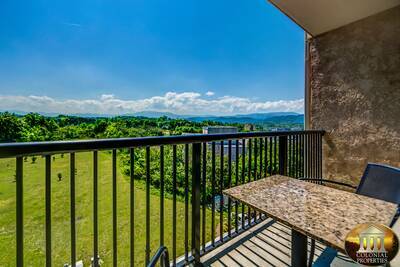 The location was great (despite my fear of heights), as it was tucked up on a mountain far enough away from the busy Pigeon Forge Parkway, but a close enough drive to enjoy what the area offers. Would love to return someday. Thank you. “ A Star Above was a great cabin. We enjoyed the peace and quiet. We loved the king size bed and the outdoor hot tub. It was well kept. “ The cabin was beautiful. I loved the rooms, Jacuzzi, and electric grill. There was games, books to read and even a pool table. “ Everyone was great and the cabin was above clean! Thanks! “ This cabin is so nice and peaceful! “ Great weekend getaway. Colonial was a pleasure to deal with and A Star Above is a wonderful cabin. Would love to purchase one! “ One of the sweetest little cabins we have stayed in and it had lots of room!! 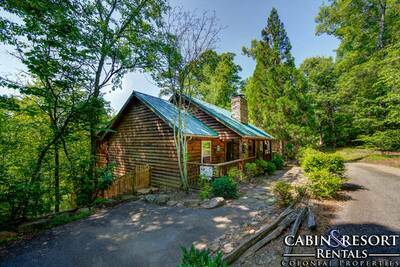 “ Beautiful cabin and had all the amenities we expected and more! There were some issues with the satellite TV service in the beginning but were quickly resolved. “ This rental was excellent. Looks just like on the internet. We were there with friends of ours to do some Christmas shopping. It was hard to leave the cabin it was so awesome. It had everything we needed more. Loved that it already had coffee in the fridge. Very homey and comfortable. We have been doing this trip for years and this is the first cabin we have considered coming back to. “ The cabin was beautiful. We loved the decor!! We enjoyed getting up and smelling the mountain air. This was our first time with Colonial Properties and we will return! “ Thank You! This was a great getaway! 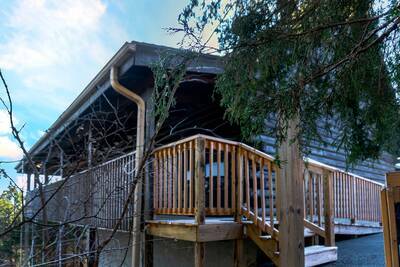 “ A Star Above was a great weekend getaway and the cabin was tastefully decorated and cozy!! “ I absolutely love A Star Above. I would recommend this to anyone. It was up in the mountains and so peaceful. The office staff and owner were very nice and easy to work with. Thanks for such a nice time! “ The cabin was very nice. Exactly as pictured. If you want secluded privacy, this is the place for you. We loved our stay! “ My family and I really enjoyed ourselves and hope to come back soon. The cabin was great and very clean. It was beyond what we expected. “ We had a great time. “ My family and I had a wonderful experience while staying at "A Star Above". The cabin is new and well appointed. 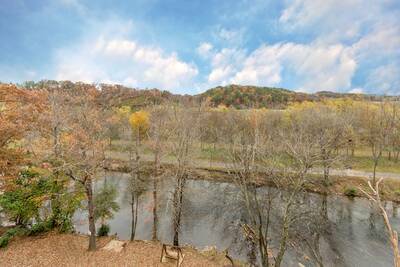 The location is quite private but not to far from everything that one would need. We would not hesitate to stay there again and probably will!! “ The folks at colonial properties are the most friendly that we have had the pleasure to deal with. We love the location of the cabin we stayed in it was in the shagbark gated community out away from the noise but still close enough to be there in just a few minutes.we woke every morning to a tom turkey gobbling so we had wildlife right at the door.overall we were pleased with our stay. “ Great views!! This was my first time renting a cabin for vacation and it was a wonderful experience. The cabin was clean, well-maintained, cozy, comfortable and the view was magnificant. The owner makes sure that you have a great experience by making you feel at home. Everything that you need is there. The employees were also very hepful and quick to fix anything that was wrong. All in all, I loved it and would do it again. “ We were very pleased with our stay. The cabin was very nice and well maintained. The online booking and easy check-in was very convenient. We will definitely consider your properties again in the future. Thanks for helping make our vacation a great one! “ Even though our weather was less than desirable...we had an awesome time! Absolutely loved our cabin, especially sitting out on the front porch. It was all we had hoped for. We were also able to do a lot of shopping, and really enjoyed the Dolly Parton Stampede... so much to do in that area. Gatlinburg was probably our highlight of places we visited. We will definitely be back again... and am already recommending the cabin/our experience to others! 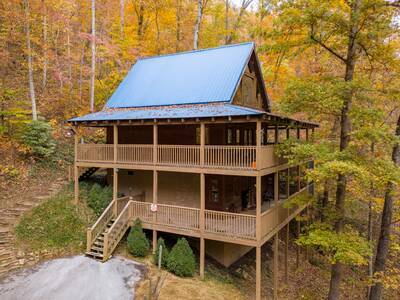 “ We have visited Pigeon Forge and stayed in nine different cabins. "A Star Above" is by far our favorite! “ It was a beautiful cabin with a lot of privacy. Would love to visit when the trees are in full color in the fall. I'm sure it would be a fantastic view. Had a great time with our family. “ We really enjoyed the cabin. The decorations are what we liked best. LOVED ALL THE DIFFERENT STARS! It was very peaceful sitting on the porch drinking coffee and looking at all the beautiful nature God has made. Thanks for a great 4 days!!! 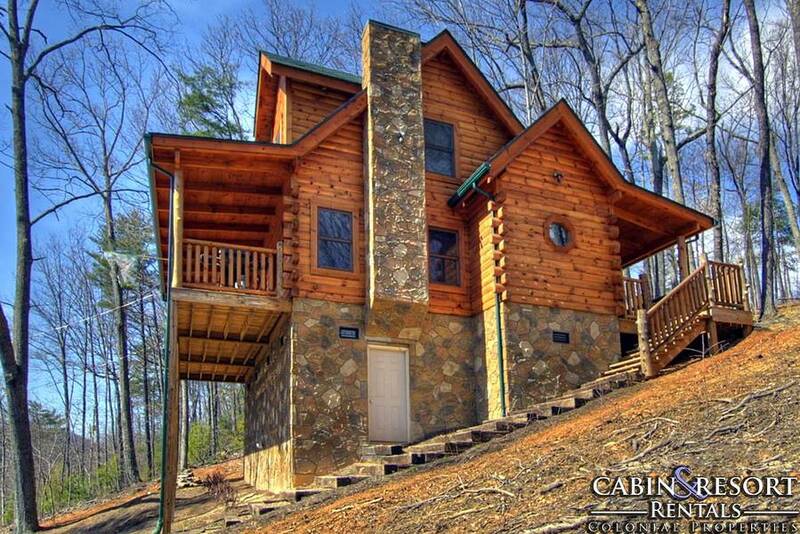 “ Loved the cabin!!!! Loved the decor but the thing I loved the most was the total peace and serenity that this cabin had to offer! Most mornings or nights my family would find me on the porch swing, just relaxing! The kids loved the hot tub which was very private! This is our second stay with Colonial and loved both cabins so will be sure to come back again: the only question is do we go back to A Star Above or try one of the other beautiful cabins they have to offer??? “ The whole experience of our vacation was perfect! We fell in love with the cabin as soon as we stepped inside and haven't been disappointed once. We will definitely be back soon-probably in A Star Above. “ The cabin is really nice. This was the first time we stayed in a cabin and will get another one every time we go now. It's really great if you have a baby. Better than a hotel can ever be!